Introducing The Britt – designed for those with a passion for the finest things in life: British-inspired architecture, with interior design and amenities that surpass European standards. The Britt is where classy meets classic and historic meets epic. Situated at Bay and Wellesley (955 Bay St), and injecting new life into the legendary Sutton Place Hotel, The Britt is steps from Bloor Street with its world-famous “Mink Mile”, and the allure of Yorkville with its restaurants, boutique shops and services. The financial district and downtown core are only a bus ride down Bay, and the subway is just around the corner. 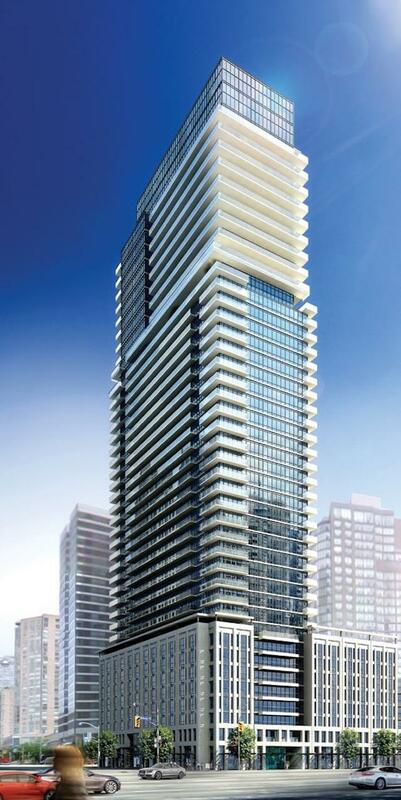 The Britt will ultimately consist of a soaring 41 storey residential tower along Bay Street with a separate 8 storey wing that fronts on Wellesley St. Munge Leung-designed amenity spaces include the elegant two – level lobby with grand staircase providing many lounging opportunities over looking Bay Street. 24-hour concierge; party room with formal dining room, hosting kitchen; equipped fitness centre and spa facility with hot tub spa, dry sauna change rooms and relaxing lounge; boardroom; outdoor swimming pool and outdoor lounge areas with barbecue, alfresco dining spaces, and a cozy fireplace. Features include engineered hardwood flooring in living dining, kitchen and den areas, porcelain or ceramic tiles in bathrooms; Munge Leung-designed kitchens with granite countertops, ceramic tile backsplash, integrated and stainless steel appliances. ECO – friendly Auto sharing program and bicycle storage. Remaining suites range in size from 319 sq ft to 844 sq ft, and are starting at $243,900. Lanterra Developments is offering new incentives, including a leaseback option on select suites. Estimated occupancy is scheduled for spring 2016.